This dish illustrates the principle that, as chef Mark Peel says, "It's not what you do, it's how you do it." The meatballs have three kinds of meat for flavor; they're made carefully and not overworked; and the sauce is clingy. For a small group, serve half the sauce (with half the pasta), then freeze the rest for dinner another night. Make sauce: In a 5- to 6-qt. pan, cook oil and garlic over medium-low heat until garlic softens, 5 to 6 minutes. Add tomatoes, salt, and pepper. Cover, bring to a boil over high heat, then reduce heat and simmer, stirring often, until thick, 45 minutes to 1 hour. If needed, crush tomatoes with a spoon to break up. Stir in basil sprigs. Turn off heat; keep warm. Meanwhile, make meatballs: Heat 1 tbsp. oil in a large frying pan over medium heat. Add onion and cook until tender, 5 to 8 minutes. Stir in garlic and cook until fragrant, about 1 minute more. Add mushrooms, fennel, salt, and pepper. Cook until mushrooms are tender, 5 minutes. Remove from heat and stir in 1/4 cup wine and the bread until liquid is absorbed. Transfer mixture to a food processor and pulse to finely chop. Scrape into bowl of a stand mixer and let cool. Add parsley, meats, and 1/3 cup wine and beat on low speed until well blended, 1 to 2 minutes. Using wet hands, shape meat into 1 1/2-in. balls. Heat 2 large frying pans over medium heat with 1 tbsp. oil each. Brown about a third of meatballs in each pan, turning once and adding oil if needed, 6 to 8 minutes per batch. With a slotted spatula, transfer meatballs to a platter. Repeat with remaining meatballs and oil. Scrape all the drippings into 1 pan. Whisk in flour, then cook over medium heat until bubbling, 1 to 2 minutes. Whisk in 2 cups sauce to loosen browned bits. Scrape into pan with rest of sauce and stir. Return sauce to a simmer. Gently stir in meatballs; simmer, covered, until flavors are blended, about 20 minutes. Discard basil sprigs. Cut remaining basil leaves into fine slivers and stir into sauce. Meanwhile, cook spaghetti as package directs. Drain pasta and transfer to a large shallow bowl. Ladle all the meatballs and about half the sauce on top, and toss to coat. Serve with cheese and extra sauce. *Crack fennel seeds with a mortar and pestle, or buzz in a clean coffee grinder. 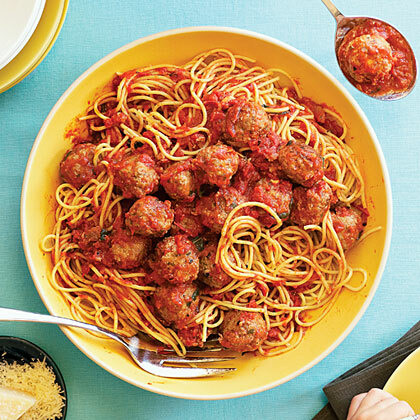 Make ahead: Chill sauce and meatballs up to 1 day, or freeze up to 1 month.